We are so consumed with the artificial grass world, it’s what we live and breathe every day, so we understand every little thing there is to do with artificial grass. We know every detail of the artificial grass world including the difference between each artificial grass range, how it should be laid, the proper way to take care of it and of course, the multitude of uses there are for this fantastic product. But just because we know all that here at Great Grass, it doesn’t mean that everybody else does, and why should they? They have more important things to think about! So it’s only natural that we get a lot of the same questions regarding our artificial grass. If you’ve had a burning question that you’ve been wanting to ask, or something to do with artificial grass has just popped into your head then have a look at the information below, because we’ve compiled a list of our frequently asked questions. Can children slide on artificial grass without hurting themselves? YES – Children can slide across artificial grass and there will be no burnt knees or elbows! Can ALL grids & manholes be covered? YES – once the artificial grass is fully rolled out, any grids or manholes can be cut out and re-glued for a clean finish! Do you see a distinctive join line when installing a large area? Only at first and it will be very faint. Once the artificial grass has been “worn in” as it were (artificial grass doesn’t actually get worn! ), the join line will fade out and look completely natural. What chemicals do I use to clean the grass? There must be some expensive, specialist detergent. It’s actually not advisable to use any high toxic chemicals or any strong detergents, as this can actually cause damage to the artificial grass. Warm water is fine or if needs be, some diluted washing up liquid. Is artificial grass fire retardant? 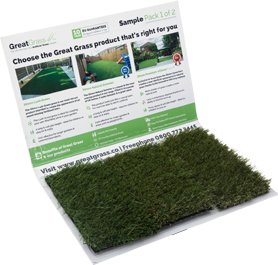 YES – All of our artificial grass ranges are fully tested and meet all requirements. Can heavy items such as garden furniture be placed on artificial grass? YES – of course! Your new artificial grass garden has to be practical, we just advise you use a type of castor under the legs to spread the weight out. This will prevent any kind of damage to the artificial grass. Check back soon for part 2 of artificial grass FAQs!